March | 2013 | I Haven't Had My Coffee Yet -- Don't Make Me Kill You! With over 28 million tracks in their catalog, 25 billion songs sold, and billions in annual revenue, it’s no secret that iTunes is still the major player in the digital music game. And we’ve got good news: CD Baby artists will now be able to make their music available for pre-sale on iTunes. An iTunes pre-sale allows your fans to order your music from iTunes in advance of its release. Then, on the official release date, your pre-sale customers will receive an automatic download of your music into their iTunes player. All pre-sales will be credited on the official release date, so the more pre-sale purchases you get, the higher your sales ranking on the day of the official release. A pre-sale must run 1-4 weeks before the Current Release Date (the actual release date you set in your CD Baby member account). In order to be eligible for pre-sale, your Current Release Date must also be at least 30 days in the future. To make your music available for iTunes pre-sale, sign it up with CD Baby! via How to Do an iTunes Pre-Sale for Your Music DIY Musician Blog. The Psychology of Music | Visual.ly. One extremely important thing to keep in mind when it comes to fan engagement: never leave a fan hanging. If they email you, email back. If they leave a comment on Facebook, respond, or at least “Like” it. If they reply or ask a question on Twitter, respond back. A short answer or a quick thank you can go a long way in making that fan feel special, like they’re an active part of your world. via Blog – The 3 Pillars of Music Fan Engagement. These are the required characteristics that your band needs in order to have a successful Kickstarter. Period. Well, I have too. But whether we see these qualities or not, they do exist. In the case of a project for $800 that has 35 backers, sure you may not see them up front. But that project creator had to put it on the line somewhere, whether it was in face to face conversation, telephone calls, text messages, or social media communication, who knows? In TPK’s case, it is all right there in the project’s video and project description. The Purpose Worth Backing and Personal Connection sort of blend together in the back story of the project: a tumultuous childhood on the run from a convict father and a mother’s love for an outlaw. It is, indeed, an intriguing storyline and definitely one that many people can envision themselves in. Ian (L&R): How and who have you reached out to? individual personal connections? coffee shop dwellers? family? etc… by in-person discussion, email, FB, phone, etc.? Mickey (TPK): One thing we did specifically, was printing and distributing of Kickstarter flyers. They had our name/ logo and link for people to check out and help fund us. We put these at all our favorite local spots. (coffee shops, clothing stores, venues etc) We did post a ton on social media sites…and while overkill is never good, we realized that a relatively small amount of people were actually seeing each post we made… comparatively to how many “friends” we had, so in all actuality many didn’t get the message till the 2nd and 3rd post. Also, a friend in marketing told me in order to get people to act it can take 7 to 12 times of reminding, so we took this concept to heart. We sent out personal e-mails too. Ian (L&R): How many on your mailing list? Ian (L&R): Where has your funding coming from? Mickey (TPK): Friends and friends of friends mostly. A few family members, but mostly acquaintances. Although, some of the band members families did go above and beyond and were such a blessing. So we couldn’t discount them certainly! Ian (L&R): Assuming much of it was through personal connections, how did those interactions go for you? What did you say, where you comfortable saying it, and how did people respond? Mickey (TPK): If we had direct interactions, we’d start by talking about our album and the concept for it, or inviting them to shows. If they wanted to know more it was natural to explain about Kickstarter and often people were excited to help out and get our album in advance. One other lesson I learned – We found out that a lot of the time the people you plan on being your biggest supporters may let you down. Although, what’s exciting about that is realizing you have all these people you never dreamed of rooting for you to succeed. Don’t give up…. listen to the encouraging voices, they have more value than all the negative ones. Ian (L&R): Anything else that might be helpful? Mickey (TPK): Don’t worry about publicizing too much or over-saturating. What feels like overkill on your end, might be just the right amount of times to finally encourage that person who keeps forgetting to back. Oh, and pray, pray lots! When it comes to building a following and marketing your band, cultivating and regularly engaging your email list with content they value is definitely the way to go. But many bands haven’t had the chance to do so either because they’re just starting out or because they haven’t taken the time to do it. Either way, when it comes to marketing your Kickstarter project, there is MUCH TO BE GAINED from your personal connections. Mickey’s situation and advice looks much like others whom we have encountered in the midst of writing our 100 Music Kickstarters series. Get personal and reach out to those in your Circle of Influence! via How To Fund Your Band’s Kickstarter When You Have No Fanbase – Launch & Release. Many musicians find the legalities of the music industry scary or, according to some research from my blog and newsletter, haven’t even looked at a contract. In fact, the music industry itself has made a point to tout it’s legal strength anytime someone tries to do something inventive and effective in the music space, rather than trying to learn from or emulate the result (zing!). Media: This is essentially the “what” of a music license. Will it be broadcast on TV, streamed on the internet, or will it be used for an in-house presentation? It can be any one, or any combination of, pretty much anything you can think of. Term: This is the “when” of a music license. Licenses can be as short as a one-time usage or as long as eternity (called perpetuity). While there are few times as an artist you would want to license a song in perpetuity, this is something music libraries do with relative frequency. It also saves a huge headache for the producing company, and keep in mind a license in perpetuity is only for the ONE usage outlined in the media definition. Territory: This is the “where” of a music license. This will delineate where exactly this particular project is going to show up. Will it show up all over the world? Will it just be in Ohio? Maybe it’s going to be shown at a convention center. There you have it, the licensing basics. Keep in mind all of the above can be adjusted and negotiated and the cost of the license should reflect such adjustments. One final point: It comes down to how many people are going to see a project, and how much you value your music, the exposure, and the project itself. If someone wants to license your song for all-media, worldwide in perpetuity (which I would HIGHLY advise against unless you’re running a music library), they’re anticipating a lot of people are going to see it. This means the exposure is high, which is great, but they’re also asking for a lot of rights which means it should be a cost consideration vs. the history of your song. In the end, you can do a lot of legwork as far as marketing and licensing music yourself. When it comes to contracts of course consult a lawyer before signing anything. But understanding these basics should help give you a good idea of how to gauge a music license and evaluate a proposed fee to ensure you’re getting a great deal. via Three Must-Know Music Licensing Contract Points | American Songwriter. via How To Make A Living In The Modern Music Business | Indie-Music.com. 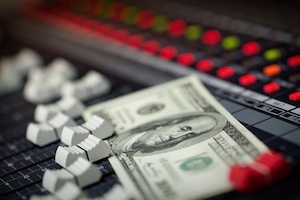 WANT TO INCREASE YOUR BOTTOM LINE AS A MUSICIAN? Do you have another talent that your fans don’t know about? My Cyber PR Guide to Crowd Funding will HELP and you can get it by (that’s right!!) contributing to MY crowd Funding campaign! via Making Money from Your Music in 2013: The 7 C’s « DIY Musician Blog DIY Musician Blog.